Our workshops offer a fun, different & interesting day for up to 6 adult beginners. Learn to make a stained glass panel or ornament using the Tiffany (copper foil) technique. Take home a charming and beautifully colourful keepsake, and learn some new skills. 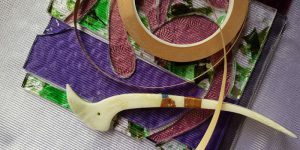 In our one-day workshop you will learn how to design a small panel or ornament, cut glass safely, apply copper foil, and how to use a soldering iron. You can design your own piece, or choose from our designs which include a cute bird, angels, 5-point star or various others. Our mini workshops are 3-hour taster sessions. You will still learn the basics as described above from a limited selection of our designs. No experience necessary; but please scroll down and read the Workshop Participant Information below to see if the course is suitable for you. Tea & coffee provided. Bring your own lunch, or you can visit one of the many nearby shops and cafes. Get in touch to learn when the next workshops will be held. An interestingly different approach to celebrating your upcoming wedding. Invite up to five friends to join you on a crafty day out. We offer a full-day format (see One Day Workshops, above, for a general idea) or a shorter 3-hour session with pre-cut glass shapes for you and your friends to assemble and solder. You will be working with glass and melted metal. Our workshops are not suitable for those with learning disabilities, or persons with no fine motor control. Not recommended for the pregnant due to the use of lead solder. (Lead-free solder can be provided at a modest extra cost.) Please wear close-toed shoes and clothing suitable for messy artwork.